How Does California Milk Standards Differ From Other States? From the nutritionist's standpoint, California's fluid milk standard is healthier because lower fat (i.e., 2 percent, 1 percent and nonfat varieties) fluid milk is fortified with nonfat solids (calcium, protein and assorted vitamins and mineral). Whereas the national fluid standard for solids-not-fat (SNF) are 8.25 percent by volume, and 3.25 percent fat in whole milk, California requires 8.75 percent SNF by volume, and 3.5 percent fat. In 2 percent milk, the SNF percentage jumps to 10 in California, while it remains at 8.25 percent under the federal standard. Put another way, the Dairy Council of California reports that the federal standard requires 261 milligrams of calcium in an eight-ounce glass of milk, regardless of its fat content. The California standard fortifies this number to 276 milligrams of calcium in whole milk, 317 milligrams in 2 percent milk and 348 milligrams in 1 percent milk. 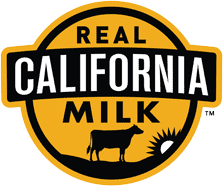 Nonfat milk sold in California is required to have 285 milligrams of calcium.